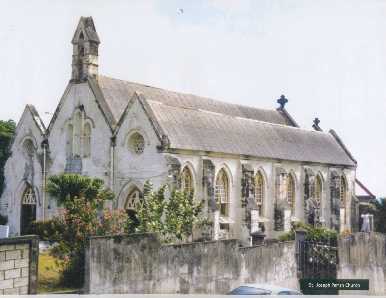 St Joseph's Parish Church was built prior to 1641 but was allegedly destroyed by the hurricane of 1780. It is certain that the Church which existed in 1831 was destroyed by the hurricane of that year. At this time, a new site was chosen and a new Church was built and it is this which exists today. It was consecrated in 1839. The Church is temporarily closed. The congregation will worship at St Aidan's Church until further notice. Sunday School will continue at St Joseph's Rectory. Bus transportation will be available by the Bathsheba bus which makes its scheduled stop at St Joseph's Parish Church at 9.30 am.